Creates a beautiful yet imposing entrance to any drive. Stylish arch top provides visual appeal. Fitted with classic spear top finials and circular scrolls the Balmoral wrought iron style estate gates features a visually pleasing arched top for superior aesthetics whilst the heavy duty framework and infill bars ensure strength and rigidity will remain paramount at all times. Manufactured to the highest standards to ensure a quality finish. Traditional arch top creates a timeless appearance. Spear top finials and circular scrolls add a subtle style element. Wrought iron style metal estate gates have a black primer finish that must be painted berfore installation to prevent rust and corrosion. Suitable for automation (some modification may be required). 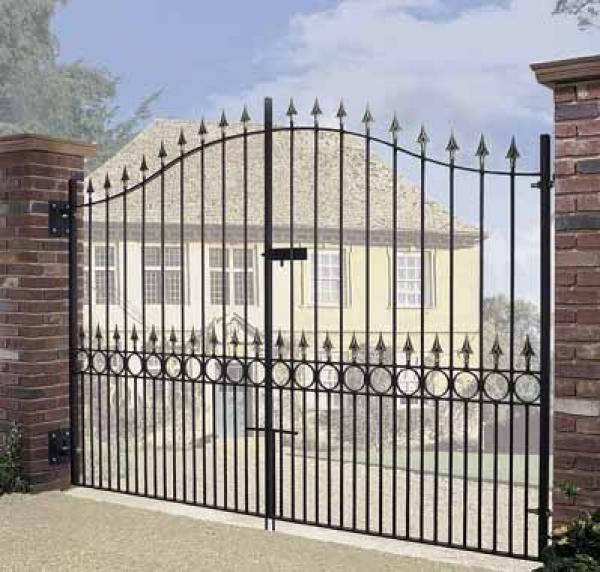 Looking for help ordering a new set of entrance gates for the front of your driveway? If you wish to speak to us in person call us now on 0844 804 5577, read the FAQ`s for general queries or have a look at the measuring guide for information relating to ordering sizes. Do you need metal posts to complete you gate installation? Where required we recommend the following items. To discuss the optional items available for the Balmoral double gates please phone us on 0844 804 5577, email sales@gardengatesdirect.co.uk or fill in our online enquiry form.